The Orion Observation Group (OOG) was formed in 2003 when the love of stars and all things astronomical brought a group of Boland friends together. We communicate on an informal basis via e-mail and Facebook. 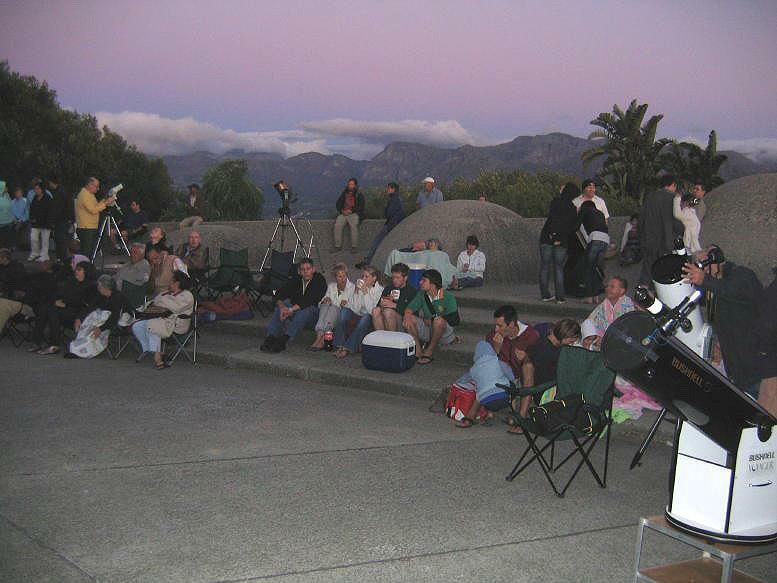 We are involved with outreach programmes and have regular star-gazing evenings at the Afrikaans Language Monument in Paarl. Make sure to “like” our page to receive information on upcoming events. The Stargazing Picnics at the Monument are family events where everyone gets a chance to look at the night sky through our telescopes. Contact: Serena Ingamells (082-729-2716). The Kroonstad Astronomy Club is run by a group of astronomy enthusiasts in Kroonstad who meet once a month, usually during a new Moon and on a Thursday. Contact: Barry Fourie (082 443-3246 or 056 212-2535). [ UCT Astronomy Club on Facebook ]. The Friends of Boyden fosters public appreciation of the historical, cultural and scientific value of Boyden Observatory, promotes public interest in the affairs of the Observatory and raises funds for the restoration and preservation of the installation. The Friends organize a number of activities such as popular lectures on astronomy and viewing sessions at Boyden. Membership is open to all interested persons, who receive the Naghemel newsletter. Contact: B van Zyl (051 436-7555) [ http://www.assabfn.co.za/friendsofboyden ]. The Port Elizabeth People’s Observatory Society holds bi-monthly meetings on the 3rd Monday of the month. Contact: PO Box 7988, Newton Park, Port Elizabeth. The Rhodes University Astronomy Society meets every Tuesday (during university terms) in the Department of Physics and Electronics at 19:30 for a lecture given by a member of the committee or a guest lecturer, then we move to the Simon Walsh Observatory to star gaze with the help of our 10″ telescope (weather permitting of course). Contact: Jax Stevens [ chair.astrosoc@gmail.com ] [ Rhodes AstroSoc on Facebook ]. The Soutpansberg Astronomy Club meets each month on the Saturday closest to New Moon. Meetings are generally held at a site a few kilometres outside Louis Trichardt. Contact: Kos Coronaios (079 148-4934) [ elephantcastle lantic.net ] [ SAC on Facebook ] . The Southern Peninsula Astronomy Club (SPARC) in the Western Cape meets monthly in the Fish Hoek Civic Centre on the first Thursday of each month at 19:30. Visitors and tourists are welcome.The club focuses primarily on those at beginner and intermediate level of understanding of astronomy. Contact: Wolf Lange (021 785-3713 or 079 358-4227) [ wolflange wol.co.za ]. The West Rand Astronomy Club (WRAC) in the West Rand area of Gauteng meets monthly in the Dutch Reformed Church offices, Corlette Avenue, Witpoortjie on the last Wednesday of each month at 19:00 (except December, when there is no meeting). Telescopes are set up for viewing (weather permitting). Viewing evenings are also held at a nearby site on the Saturday evening closest to New Moon. Weekend star parties are also arranged. The club focuses on all levels of understanding of astronomy, including astrophotography. The WRAC is also very active in astronomy outreach programmes. Beginners and visitors are welcome. Contact: Kenny Nevill [ kenny wrac.org.za ] [http://www.wrac.org.za/].